As the backdrop for virtually every photo that’s ever been taken of downtown Telluride, Ajax Peak looms high and large over the Telluride valley. As a short, moderately steep climb, it won’t take you all day to get the top and soak up views at the top. From Pandora Mill on the edge of town, hike up the gravel road and follow the sign toward Bridal Veil Falls. Zig-zag your way up the jeep-road switchbacks to the top of Bridal Veil. Rather than going through the gate to your right, veer left on the gravel road (the “One Way Only – Do Not Enter” sign applies only to vehicles, not hikers!) to continue switchbacking your way up toward Ingram Falls, the canyon’s other major waterfall. Here, you’ll need to cross the top of the falls. Beware that in late spring, the falls may be raging hard enough that crossing is ill advised. (Also keep in mind that on warm spring days, the water level can rise significantly over the course of the day as snow melts.) A bit of mining refuge—a narrow steel cable—exists at the top of the falls to aid you across, but if in doubt about the safety of crossing, err on the side of caution and save this hike for later in the season when the water level has come down; the margin for error here is small. After crossing the falls, continue climbing up the road. Keep an eye out for mining cables overhead. The turnoff for Ajax can be found between the third and fourth cables, and is marked with a small rock cairn. 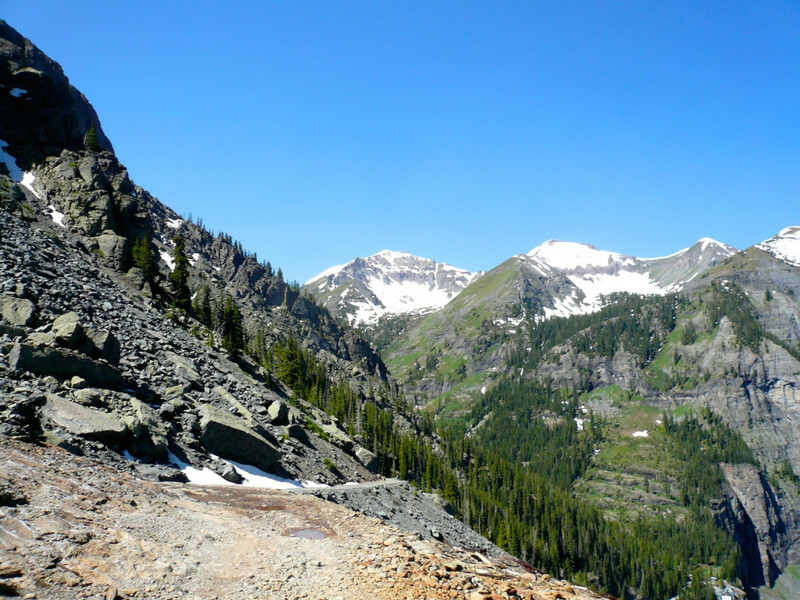 Follow the switchbacks above treeline onto a grassy ridge, then a rocky stretch all the way up to the summit, where you’ll enjoy views of town, the ski area, Imogene Pass, Black Bear Pass, Silver Lake, Lizardhead, Wilson Peak, Mt. Sneffels and even Utah’s La Sal Mountains. Don’t forget to sign the summit register before making your way back down! The road up to Bridal Veil Falls is popular with four-wheelers and jeep tours—and though it’s scenic, you’ll love hiking past the last point where vehicles are permitted, leaving the tourists behind to venture even higher up into the box canyon. 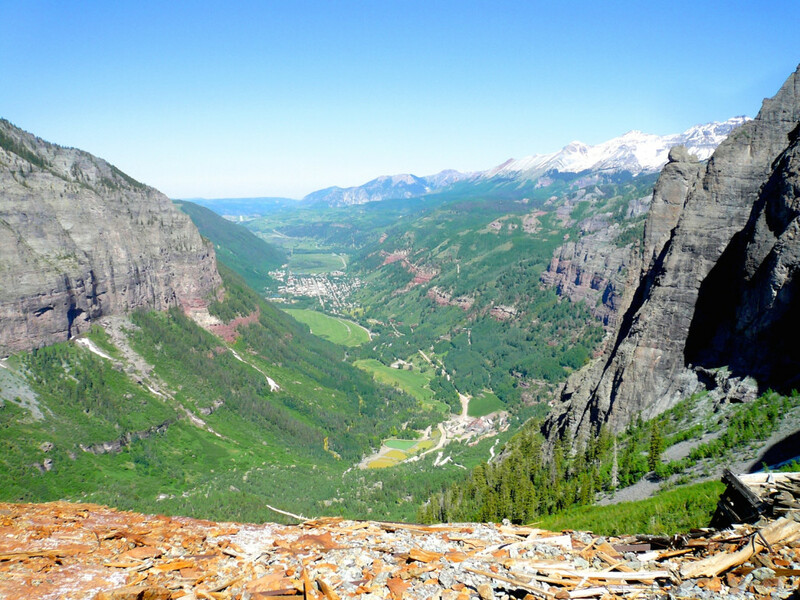 The 360-degree views from the top of Ajax are unmatched, with a clear view back down your entire route, all the way to the town of Telluride—so you can revel in just how burly a hike you’ve pulled off. Peak baggers will love the opportunity to nab this iconic peak that graces every postcard of downtown Telluride in existence. From the town of Telluride, drive east on Colorado Ave (the main drag) for approximately 1.5 miles, passing the Pandora Mill site on your left. Shortly after, you’ll find a large unmarked parking area. If you have a four-wheel-drive, high-clearance vehicle and are comfortable negotiating narrow, rocky cliff-side gravel roads and hairpin turns, you can also continue driving past the parking area all the way up to the top of Bridal Veil Falls, and begin your hike into the basin from there. There are a few parking spots right at the gate at the top of the falls. Do not, however, block the gate—and if no parking is available when you get up there, turn around and find a wide pullout (out of the way of traffic) on your way down to park on instead.